The FHT is delighted to announce the winners for its prestigious 2018 FHT Excellence Awards, which showcase how professional therapy practitioners and trainers are making a difference to those living and working in their local community. For developing a new delivery model for a complementary therapy service within an NHS palliative care unit. For her work in helping to improve health and reduce injuries in dancers, professional artists and other movers. For sharing the content of her group meetings via a number of online platforms for therapists unable to attend in person. For his inspirational story of retraining as a complementary therapist following his first-hand experience of using therapies for a back injury. For her work in developing the first NHS approved therapy training school and a unique NHS Certificate in Complementary Therapies. Read more about our 2018 FHT Excellence Awards winners in our special winners guide. 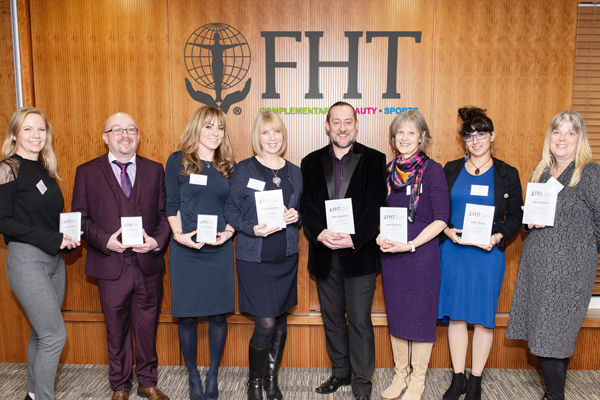 This year, the FHT Excellence Awards were held at our 2018 FHT Conference, a special one-day event exploring some of the challenges and opportunities for the successful integration of complementary therapies into mainstream care.